I had a craving for Rissoles the other day, and when I told my other half this his initial response was quoting The Castle (for those playing in another country, The Castle is a brilliant Australian movie that embarrassingly depicts a typical Australian family). It made me think, “Rissoles – are they Australian? ?” I did a bit of research and found that yes they are, but they are also a pretty international dish – there are a lot of countries that do their version of the ol’ Rissole. The Australian version is cooked on a BBQ and usually consumed with tomato sauce (the sweet bottled variety, otherwise known as Ketchup). So I wondered, what are those things I’ve grown up eating? They are in fact called Polpette. Polpettine (smaller version) are the ones that you find in Spaghetti. This was the first time I’d made these by myself, so I spent the whole day calling mum asking questions (sorry for interrupting your movie mum!). I’m not sure where this recipe came from but I assume she learnt this in Italy – you see mum spent about 7 years living in Italy after she met my dad there, so even though she’s Australian, she knows good Italian food, great Italian food in fact. 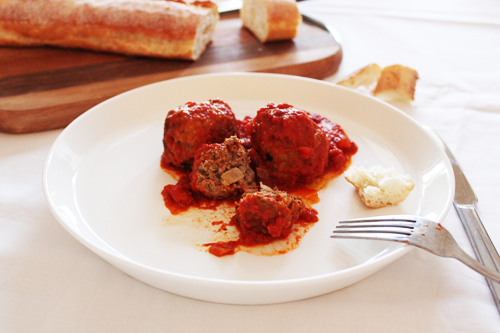 So below is my tested and successful recipe for Italian Meatballs with Tomato Sauce, and might I add, they were delicious! I love eating these with some crunchy bread and a salad, but this recipe actually makes quite a bit of sauce, so it would go very well with some pasta. It makes 12 medium sized balls, but you could adjust to the size you like. In a large bowl, add the mince, onion, garlic, breadcrumbs, parmesan, parsley, eggs and salt and pepper, and mix well until all ingredients are combined. Hands work best with this. In a small bowl, add a few tablespoons of flour. Take a large heaped tablespoon of the mince mixture, and using your hands, mould into a ball. Make sure there are no big cracks in the balls and they are 'sealed'. Roll the ball into the flour and lightly dust of any excess flour by moving between hands. When they are evenly coated set aside and continue with the rest of the mixture. In a large heavy based pot on a medium heat, add a good splash of olive oil. Add the meatballs in batches, and cooked until the outside is sealed and lightly browned. When all balls have been sealed, return the rest to the pot and add the tin of tomatoes and the passata. Add a good pinch of salt and give them a stir. Bring to the boil, then turn down to a simmer and cook for 1 hour, or until the sauce has thickened and the acidity in the tomatoes has gone. a friend made these for me last night. Oh my god. so good. i ate so much that i had to have a nap straight after!! yummm!